I have placed bleed, but it doesn't show up. Elements that lie outside the page (bleed) are also not visible. That feature is not in Publisher yet, there is a thread somewhere about it as it is a pretty important feature if not a completely necessary feature. Hopefully it will be there with the next update. Bleed guides is a very important feature and to be able to see it as I work in the print trade and I set up make ready pages and a lot of designers don't add bleed to their final PDF's prior to printing! We are still writing the bleed preview, and it didn't make it into this first beta. No doubt it will appear in an early update if it passes internal testing. Light grey on medium gray may make someone happy at Serif because of how unobtrusive it is. But how about let us configure the color of the bleed indicator because it's just darn hard to see. Or make it red. 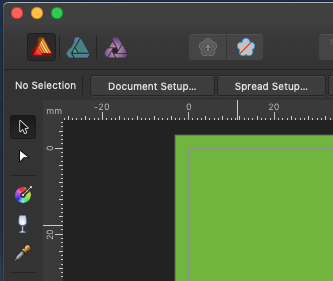 Wow, it getting really good, bleeds works and you can view bleed in the view tab > Show bleeds, playing around with effects and so on, its like having Indesign, Photoshop and Illustrator all in one Application!